Still a very sultry 27°C at 11pm Louisiana time, my hair is enormous from the humidity and New Orleans is still well and truly awake. We have just had the best day and it’s showing no signs of slowing just yet, despite being well past my country bedtime. More caffeine may be on the cards. On a bend of the Mississippi River 160 kilometres from where it empties into the Gulf of Mexico, New Orleans has been a busy port since the early 1700s. 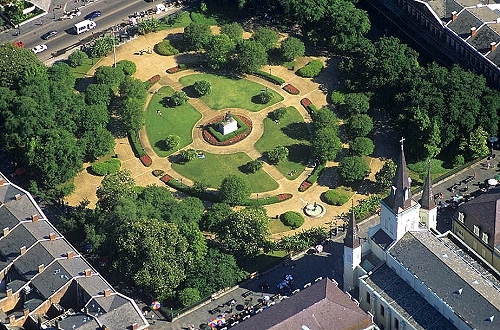 The city was founded by the French Mississippi Company on land already inhabited by the Chitimacha, and named for the Duke of Orléans. It was then ruled for 40 years by the Spanish and snapped up for a bargain price by the US in the 1803 Louisiana Purchase. As many know, New Orleans is famous for its distinct Creole and Afro-Cuban cultures, as well as its architecture, food and music. My brother Chris loves to both play and compose music and, as part of his (landmark) birthday celebrations, Leroy and I decided we’d take him on a virtual trip to the Crescent City. New Orleans is close to Leroy’s heart, having lived here for a few years in the late 1990s. While many of his friends from that time have moved on in the interceding years, he was still excited by the opportunity to show us around for the day. He had briefed me intensively on what to expect and explained what we could reasonably fit into one day. One long day. Chris, of course, was kept in the dark until the last possible moment. Leroy’s friends Ruby and Jean-Batiste would be meeting us later, but had suggested that we contact Arthur, one-time communications director for the Louisiana State Museum and now a purveyor of walking tours, to get an early-morning feel for the city while it was quieter and slightly cooler. 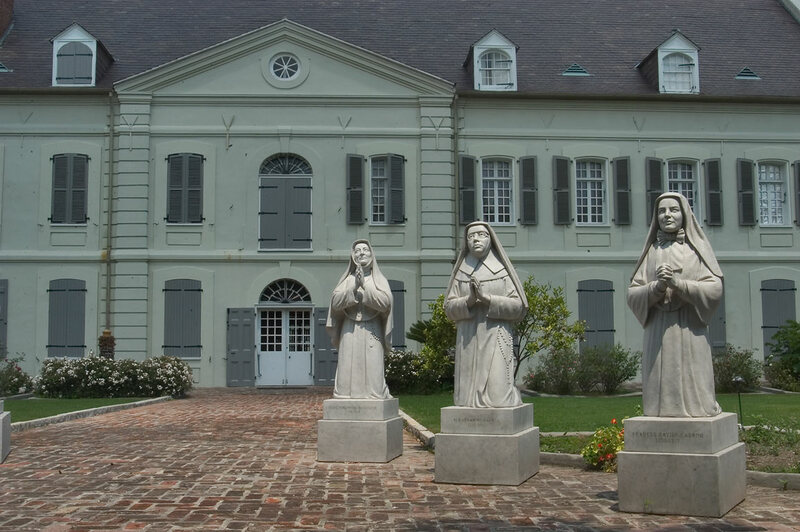 With Chris now in the know — we’d kept it a secret for as long as possible — the three of us arrived in an alley opposite Jackson Square, between the St Louis Cathedral and the museum. Accompanied by the faint aroma of mud and decaying plant matter, stepping into the dense river mists rising from the Mississippi*, it was as though we’d stepped straight into a steamy bathroom. A lone street sweeper plied her trade with a tiny broom. We met up with Arthur at Restaurant Stanley on the corner of St Ann and Chartres. Over coffee he filled us in on a little of the history of the city and asked about our interests, then took us on a fascinating walk through the streets of the French Quarter, along a section of the river and to the Ursuline Convent where, not having a huge interest in 18th century convents, we didn’t linger long. 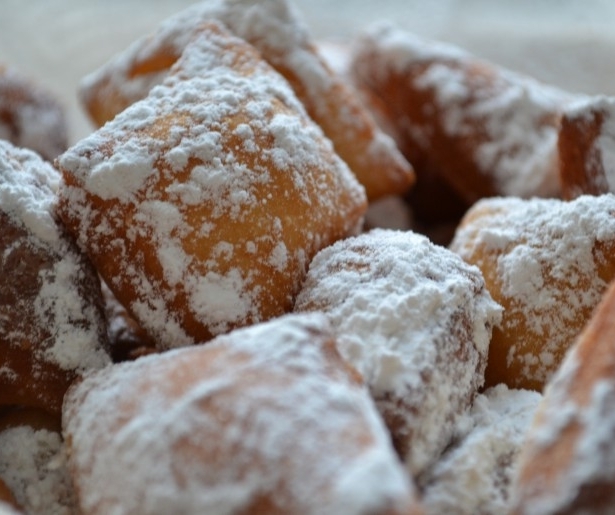 Returning to Jackson Square, Arthur dropped us off at the famed Café du Monde and we joined the already thronging masses for café au lait (Leroy and I), orange juice (Chris) and beignets (all of us). Choking and spluttering on inhaled icing sugar, we plotted our next move. 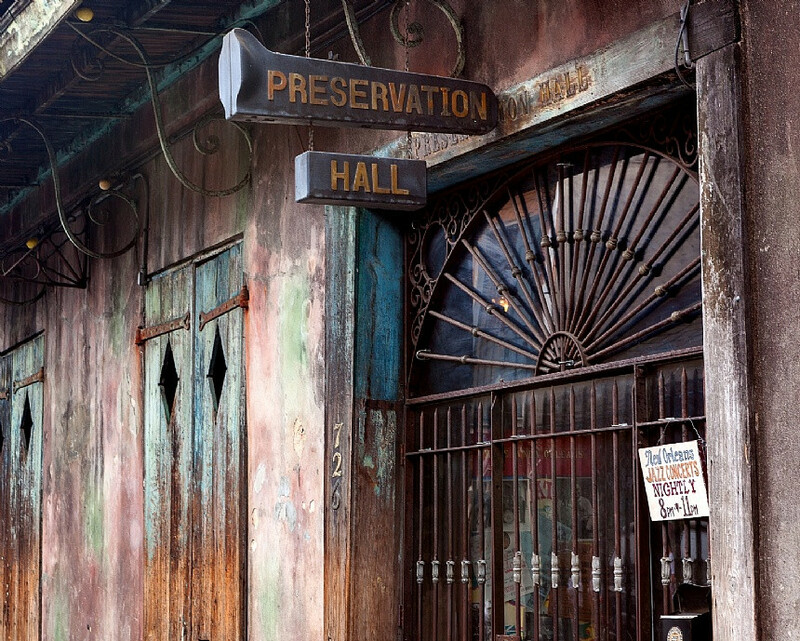 All sugared-up, we wandered north-west along St Peter Street to Preservation Hall, established in 1961 to ‘protect, preserve, and perpetuate‘ the traditional jazz of New Orleans. The gate was locked, but Leroy fairly hollered** through the bars and a dapper old man appeared out of the gloom. 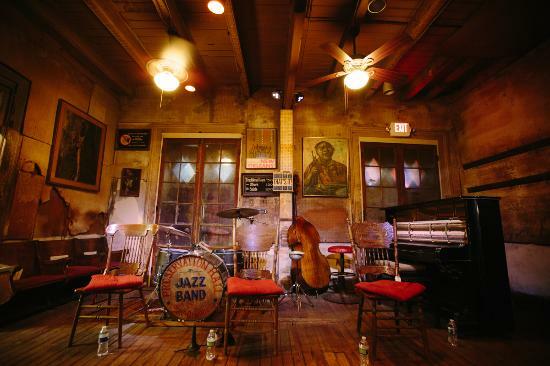 I never did find out exactly what Ambroise was doing there, but he took us through to the music room to meet the house band: the accurately, if prosaically, named Preservation Hall Jazz Band. We were introduced to Ben, Charlie, Clint, Ronnell, Walter, Kyle and Branden. Chris’ jaw dropped as he gradually realised that he’d be spending a few hours working with the band. Our finest moment. We were all in awe meeting Charlie Gabriel — who, at almost 85, was still playing saxophone and clarinet and performing regularly — but Chris was especially wide-eyed with excitement and, I guess, a little nervousness. Piano player Kyle Roussel took him aside and they began discussing music, playing around on the piano. Leroy and I chatted with the rest of the band. Mostly I listened, as Leroy told stories and asked about people and places from 20 years ago. I managed to embarrass myself in front of Ben Jaffe as I blurted out my strange partiality for the double bass and their players. He laughed and asked how I felt about tuba players (he plays both). Early afternoon, we temporarily farewelled the band and headed off to The Fly, a park in the Garden District, to meet up with Ruby and Jean-Batiste and a handful of their artist friends. Leroy was in his element, catching up on 20 years’ of news while a huge pot of crayfish, garlic, vegetables, sausage, citrus and spices bubbled away on a portable gas stove nearby. Fortunately Leroy had primed them on my status as a ‘timid carnivore’ and non fish-eater, but I still felt bad not tasting any. The other two ate with gusto. We played appalling frisbee for a while, then Chris and I left Leroy and headed off to do our own thing — Chris to work with the band some more, and me to explore. I hired a bike from Alex’s Bikes in Marigny, Leroy’s old neighbourhood of brightly painted houses and urban renewal projects, and rode up Esplanade Avenue to the New Orleans Museum of Art (NOMA). It was so nice to experience air-conditioning for an hour or so before riding out into the steam bath once again. I toyed with the idea of dropping in to the Audubon Butterfly Garden and Insectarium in the old Customs House on Canal Street, just to say I’d been, but quickly realised that wasn’t reason enough. I did, however, pay a visit to the small and decidedly atmospheric New Orleans Historic Voodoo Museum before returning the bike. After a restorative beverage and toasted cheese sandwich on the balcony of a restaurant/bar in Frenchman Street, I decided it was time to take advantage of the perks of virtual travel and bypass transport altogether. I called Arthur and arranged to meet him for a tour of St. Louis Cemetery No. 1, New Orleans’ oldest cemetery and established in 1788; the same year the First Fleet landed in Australia with its boatloads of convicts and colonists. I thought the voodoo museum was atmospheric, but after Arthur’s stories of burial customs and Afro-Catholic spiritual practices, alongside tales of some of the cemetery’s residents, I was well and truly ready to head back to Preservation Hall to meet up with the others again. I wondered if Chris realised yet that he’d be playing a song with the band in the first show of the evening. He did. The rest of the evening passed in a blur of music, eating, drinking, dancing and even a spot of pool playing at the combination bar and laundromat that is Igor’s Lounge. We’re about to head back to Ruby and Jean-Batiste’s in Bywater, but I strongly suspect we’re not going to be sleeping anytime soon. Don’t bring up Hurricane Katrina in conversation with a local. If they want to talk about it, they will. ** I have never used that word before in my life, but it seemed to fit the occasion.